The Canada-wide action in support of workers at Tim Hortons was a huge success on January 19 with over 52 actions across the country! Thousands of customers and workers came out to support workers facing cutbacks on meal breaks, hours, benefits and other labour conditions. 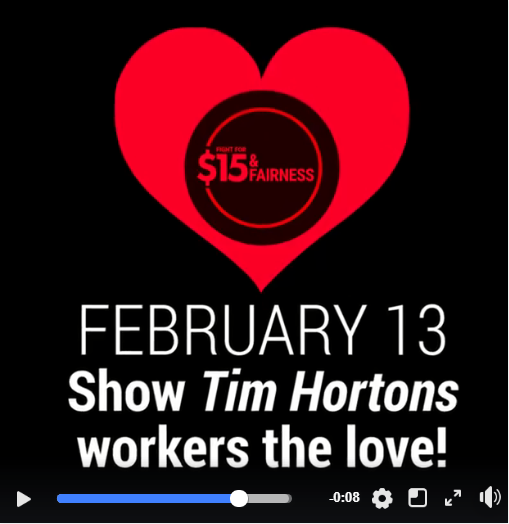 The Fight for $15 & Fairness is now inviting all of you to take part in an action on Tuesday, February 13 to show that our love for workers wronged by Tim Hortons is still strong. If the Tim Hortons parent company thinks we will forget about fairness for workers while they stay silent on the issue, they can think again. Will you join us on February 13? It’s going to be a great action – already, there are more than 70 visits to Tim Hortons planned just in Toronto alone! Click here to share this video on Twitter. We are also ready to call out other businesses that are using the $14 minimum wage as an excuse for cutbacks and for raising prices to increase profits. Many big name restaurants are using tip outs from their lowest paid workers to cover minimum wage increases, as you can see in this Marketplace news clip. While this form of wage theft isn’t new to servers, it is especially shameful of employers to increase the percentage of tip outs in the wake of a minimum wage hike meant to move us toward income equality. We know these companies can afford to do better by their workers. Why are we so sure they can fork up the money to boost wages? It has been proven possible by businesses and institutions that have chosen to do the right thing. Tim Hortons can learn good business sense (and common decency) from smaller coffee shops like JJ Bean and Coffee Public that make fairness to workers a priority and, in turn, decrease turnover expenses. Tim Hortons could also follow the example of Freshii, whose parent company is offering help so that franchise owners don’t feel they have to make workers suffer just to save money, according to a CP24 news report. Businesses and institutions can also rip a page out of the University of Toronto’s textbook and begin to honour the spirit of equal pay. This Metro News article reports that U of T has decided to pay all workers, including temporary workers and those on contract, at least $15 an hour before the law requires it on January 1, 2019. Join the action on February 13! Sign up here to show Tim Hortons that workers have our support. When you go to any restaurant or business, ask the manager if they made cutbacks, if they are paying the right minimum wage, and if they are using tip outs from servers to pay other employees. Write a letter to the editor saying that this long overdue minimum wage hike is meant to share the profits with the lowest paid workers. It is not an excuse to increase profits by shortchanging workers. Learn your new rights at work, and let other workers know! If you think your rights are being violated at work, please call the Workers’ Action Centre at 416-531-0778. All calls are confidential. Let’s keep fighting to make sure all workers benefit from the new rights we’ve won!